Three methods have commonly been used to estimate fractional synthetic rate (FSR) by measuring the incorporation of radiolabelled amino acids into protein relative to the specific radioactivity in the precursor pool (flooding dose, pulse dose, and continuous infusion). While numerous assumptions must be accepted to calculate FSR using any of the three methods identified, three of the assumptions are known to impact, and compromise, the accuracy of the estimated FSR. Specifically the assumptions that the free amino acid pool is homogeneous, that the protein pool is homogenous, and that there is no recycling of amino acids from the precursor to protein back to precursor pool of free amino acids are all well recognized as assumptions that are not correct, but made to simplify the estimation of FSR from tracer data. As previously discussed, in the intact animal, free amino acid pools include plasma, extracellular, intracellular and aminoacyl-tRNAs. Clearly, there is not one homogenous pool of amino acids in the animal. In addition, it is likely that the intracellular pool of amino acids is not a homogeneous pool. There is considerable evidence that the specific radioactivities of an amino acid vary between the free amino acid pools and that the differences between pools are impacted by physiological state. Thus, no simple algorithm can be applied to convert the measured specific radioactivity of, for example, the extracellular pool, into the estimated specific radioactivity of the aminoacyl-tRNA pool, the amino acid pool that more truly represents the pool of amino acids used for protein synthesis compared to the other identified amino acid pools. In attempting to correct for this deficiency, the loading dose method has been used to 'force' the specific radioactivities if the various free amino acid pools are not to be as diver gent. Still, research has shown that, depending on the tissue and the physiological state of the animal, the specific radioactivity of the aminoacyl-tRNA may be in between that of the extracellular pool and the intracellular pool, or may be lower relative to both of those pools. Given that the specific radioactivity of the precursor pool is used to calculate FSR, it is necessary for improved accuracy to 'know' the specific radioactivity of the true precursor pool for protein synthesis, at present assumed to be aminoacyl-tRNA. This can be accomplished in one of two ways. First, one can actually measure the specific radioactivity of the aminoacyl-tRNA. However, it may also be possible to develop a more mechanistic understanding of the relationships between the various free amino acid pools and the effects of physiological state upon charging tRNA with amino acids. Although the former should provide the most accurate specific radioactivity of the aminoacyl-tRNA, determination of specific radioactivity of tRNA is a laborious procedure fraught with its own difficulties and necessary assumptions. On the other hand, it may be possible to develop a more mechanistic understanding of the relationships that exist between the various amino acid pools and describe those relationships in quantitative terms so that it is possible to predict more accurately the specific radioactivity pool of the amino acylated-tRNA. It is also recognized that the body is not one homogenous pool of protein. Rather, there are multiples of protein pools in the body, each with their own FSR and turnover rate. Thus, it must be recognized that, unless one is dealing with a specific identified protein, the estimated FSR is the result of the 'average' of FSR from multiple pools of proteins, each with their own characteristic FSR. Whereas the impact of the simplifying assumption of one homogenous protein pool is fairly easy to understand at this level, there is another more significant impact when the assumption of a single homogenous protein pool is considered in conjunction with the assumption that there is no recycling of amino acids from the protein pool back to the precursor pool. Recycling of amino acids from protein to the precursor, or free amino acid pool(s) does occur as a consequence of protein turnover. Thus, with increasing time of radiolabelled amino acid incorporation, there is an increase in the amount of that amino acid that is recycled, through protein degradation, to the supposed precursor pool. The consequence is that as one calculates FSR during time allowed for incorporation, it is noticed that FSR changes with time. The only solution would be to calculate FSR at time zero when the radiolabelled amino acid is injected into the system. Of course, that is an impossible measurement as there would be no specific radioactivity in the protein pool. To overcome the problems associated with recycling, some have elected to allow incorporation of the radiolabelled amino acid for short periods. This tends to bias the resulting estimated FSR towards the more rapid turnover tissue, as it has relatively rapid uptake of the radiolabelled amino acid compared to that of slower turnover tissue. Here again, it seems that the most reasonable approach to improve accuracy is to account more adequately for the changes in precursor and product specific radioactivities over time, as influenced by recycling of the radiolabelled amino acid. In that regard, there is the additional issue as to which amino acid pool the amino acids arising from protein degradation are directed. There is evidence that amino acids arising from protein degradation can be preferentially channelled directly back to tRNA without entering the general cellular pool of amino acids (Barnes et al., 1994). Thus, both the issue of amino acid recycling and amino acid channelling must be explicitly included in the estimation of FSR if accuracy is to improve. As with the problems associated with the precursor pools previously discussed, both recycling and channelling must be quantitatively described. Given that the changes in the system occur over time, not only must the quantitative methods for estimating FSR include the mechanistic descriptions of how protein synthesis occurs, but the estimation methods must be dynamic as well. The conclusion is that the relatively empirical models used to estimate protein synthesis or FSR are inadequate to the task. In an effort to improve the quantitative methodology available to estimate FSR, Johnson et al. 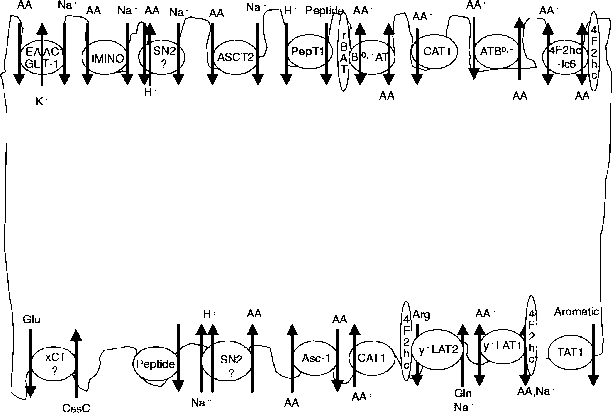 (1999a) developed a dynamic mechanistic model of protein turnover in the non-growing mouse. The model consisted of three amino acid pools (extracellular, intracellular and aminoacyl-tRNA), three protein pools (fast, medium and slow turnover), and had three amino acid sources that could charge tRNA (extracellular amino acids, intracellular amino acids, and amino acids resulting from protein degradation). Three methods (flooding dose, pulse dose and continuous infusion) of introducing radiolabelled amino acid into the model were used to estimate FSR. Predications of specific radioactivities using flooding dose, continuous infusion or pulse dose indicated that the model would be useful in estimating rates of channelling and recycling. Interestingly, the model indicated that the use of data obtained from flooding dose injections might cause inaccurate predictions of some fluxes. In a companion paper (Johnson et al., 1999b) the model predicted that time was critical to the estimated FSR. For example, using the pulsedose method, FSR was underestimated by 40-50% at 5 min and underestimated by 9-10% at 60 min. The value of a mechanistic model is that it can be a useful tool in experimental design. Johnson et al. (2000) used the previously discussed rodent model of protein turnover to design experiments to examine channelling, recycling and FSR. The model indicated that the pulse dose is the experimental design that yields the best estimates of channelling, recycling and FSR. The model suggested that changes in amino acid specific radioactivities in extracellular, aminoacyl tRNA and protein pools were greatest at 2, 6, 10, 40, 70 and 100 min. The model has also been used to perform simulations (Johnson et al., 2001). In that effort, it was clear that identification and separation of the source specific radioactivity is required in order to estimate FSR accurately.